Michael Kors is pleased to introduce our Cece handbags – a study in perfect contradictions and new for Spring 2019. The modern silhouette juxtaposes clean lines and soft curves, with a structured rectangle shape formed from gently folded edges and a curved flap closure. Heritage hardware, including a trunk-inspired pinch lock, a leather-wrapped key charm and a chain-link handle, lends an air of classic glamour to the sleek form. Every detail mirrors the silhouette's distinctive folded-edge design, including the front pocket, which tucks into the bag's interior, and the slip pocket at the back. A zippered inside pouch separates two internal compartments, making the compact bag as functional as it is chic. For Spring, the Cece will be offered in smooth leather, butterfly-embellished leather and smooth leather with pyramid studs. 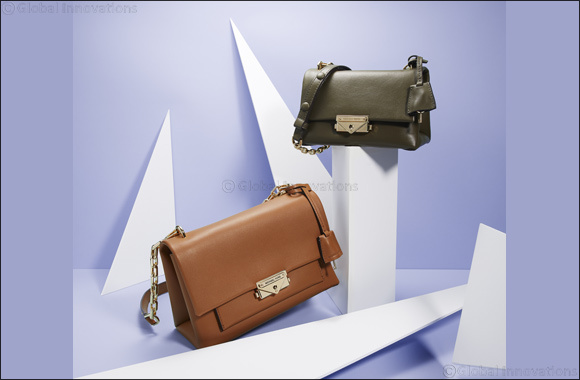 There are three sizes to choose from: an extra-small crossbody, a medium shoulder bag and a large shoulder bag, each lined in luxe microfiber suede and sold with a detachable chain-and-leather strap.